One of the primary missions of education is to train citizens for participation in our democracy. Students have to learn about the law and the ways in which government functions at the local, state and national levels. Helping students become familiar with government documents – the constitution, court decisions, executive policy statements, and legislative proposals – is a crucial part of civic education. However, it can be a daunting task, because government documents make use of specialized vocabulary, elaborate syntax, and euphemisms. The real point of a government document is often buried in qualifying phrases, passive-voice constructions, and legal disclaimers. While teachers can get around the complexity of government documents by restating the key ideas for students, the Common Core standards emphasize close reading of texts. Even more importantly, if students are to be educated citizens, they have to be able to decode government documents on their own. “… the President has decided … that (1) the public posture of the United States will be correct but cool… but that (2) the United States will seek to maximize pressures on the Allende government to prevent its consolidation and limit its ability to implement policies contrary to US and hemisphere interests. c. Bring maximum feasible influence to bear in international financial institutions to limit credit or other financing assistance to Chile…. d. Assure that US private business interests having investments or operations in Chile are made aware of the concern with which the US government views the government of Chile and the restrictive nature of the policies which the US government intends to follow. For the literacy activity and analysis questions, click here: CW3.16 Nixon Security Council. Citations: “Nixon’s National Security Council, 9 November 1970,” in The Cold War: A History in Documents and Eyewitness Accounts, ed. by Jussi Hanhimäki and Odd Arne Westad (Oxford: Oxford University Press, 2003), 401-2. Richard Nixon, ca. 1973, National Archives no. 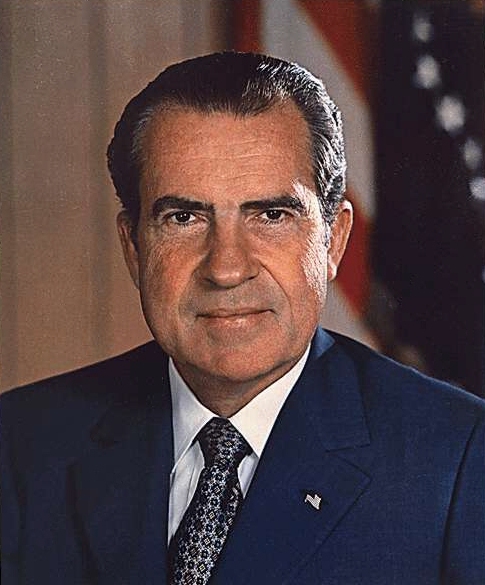 530679, Public Domain, http://en.wikipedia.org/wiki/File:Richard_Nixon.jpg.